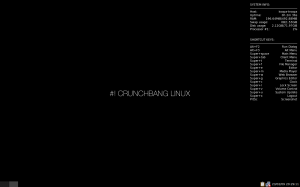 I discovered Crunch Bang Linux (#!) through Linux Outlaws. Fab kept talking about how awesome it was. Then more and more podcasts and people on the tubes started talking about it. So I wrote to Linux Format Magazine about having it on their cover disc. They said there was a lot of clamor for it to be on a cover disc, but they couldn’t because it comes with multimedia codecs potentially covered by patents. So why am I breaking my self-imposed rule to only review distros on LXF cover discs? Because one of the most attractive features to me for #! is that it is supposed to load up a lot faster and run faster than Ubuntu. Right now I have Ubuntu 8.10 installed on my laptop. I pretty much only use my laptop for travel (although I do use it in the apartment ever once in a while). So if it boots up and runs faster than Ubuntu, it will leave me with more battery power for when I travel. I already ran the #! liveCD, so I know the wifi card will work. So first off, I boot up Ubuntu to time it and see how much of a savings I’ll be getting. From power on to GDM login screen is 1 minute 1 second. And it’s 40 seconds from login to a useful desktop. (Gnome) So then I install Crunch Bang Linux. On the top right is Conky, a new (well, it’s only started to become a huge meme recently) system info panel. Yet, this is so much more than the simple system info panels that people have been adding with gDesklets and SuperKaramba. First of all, those are a little more processor/memory intensive than Conky. But that’s not even the best part about Conky. The best thing is that it is insanely customizable. Sure, most people just have some system info listed, but you can run any bash, perl, or python script and people have customized their panels to display some pretty amazing information. On the Conky website, for example, someone has customized theirs to show a bunch of statistical data from Amarok. I plan to do some heavy customization of my own and talk about it in a follow-up post of how I’m enjoying (or not) Crunch Bang Linux. Once I realized that I had my wireless card switched off (the light is lit no matter what), I was able to end my frustration and use the wireless connection at home. So that worked as it did with Ubuntu (and the #! liveCD). So what software does #! come with? You can get a complete list at their site. But some of the highlights are Firefox 3, a neat micro=blogging tool called Gwibber, the Deluge Bit Torrent client (my favorite one), Skype and Pidgin for the Internet category. I’d like to return to Gwibber in a bit. GIMP and some other programs are included for the graphics category. The office category eschews Open Office.org for Abiword and Gnumeric. As long as they write to open document format, then that should be fine. They certainly load up faster than OO.o. The sound and video category is packed! You should definitely be able to play anything your throw at the system. But I’ll test that in a second. Rhythmbox, my favorite GTK player is included, so that’s good. If you REALLY want to take advantage of #!’s speed and only run applications in the command line (something about *box window managers makes me want to), then don’t worry your little head. There are command line tools for music, file management, bit torrent, email, web, rss feeds, and chat! The Crunch Bang Linux team has taken advantage of Openbox’s configurability to create links to often used folder on the system from within the menu. That’s pretty darned convenient. And the shortcut keys you can see on the Conky screenshot above threaten to spoil me so much that I’ll hate every other distro. Ok, now let’s test multimedia and talk about Gwibber. First multimedia. I have a USB thumb drive of the files that used to be on this computer when it was running Ubuntu. I insert the drive. Nothing special appears to happen. But when I open the file manager, it’s clear that the thumb drive has been mounted. So I attempt to launch an audio file in VLC. That works. I try a video. That also works. So, multimedia-wise, it’s fine. Gwibber is one of those programs, like Conky, that I had never heard of before Crunch Bang made them famous. At least, I’m pretty sure most distros do not yet have this in the repos. Dan and Fab of Linux Outlaws were saying it’s not in Ubuntu. It collects a bunch of chmod 777 (web 2.0) sites into one program. 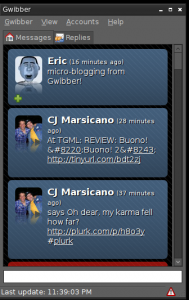 In a way, Gwibber takes a lot of the best features of Flock minus the web browser. Here’s a screenshot so it makes sense. Here you can see the latest photo uploads from my flickr account. 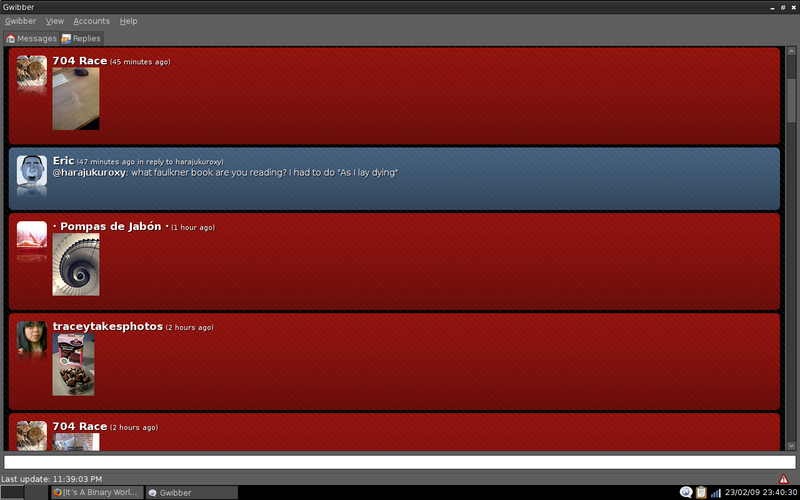 I like Gwibber a lot because it lets me do a lot of this stuff without having to constantly visit web pages. Instead the information comes to me. Now I know I should go see 704 Race’s flickr feed because he’s uploaded some pictures. It also conveniently puts replies into their own tab. 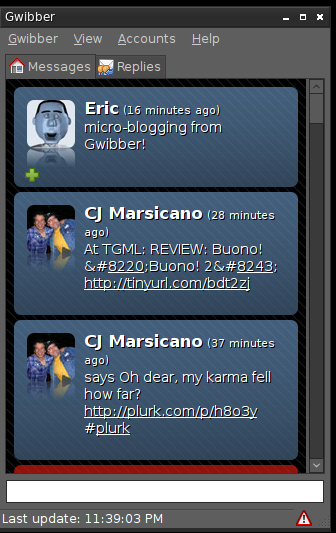 I’ve only scratched the surface with Gwibber as it also supports digg, Facebook, and other sites. I think I’ll probably be using this on both Crunch Bang Linux and on Fedora once it’s available. 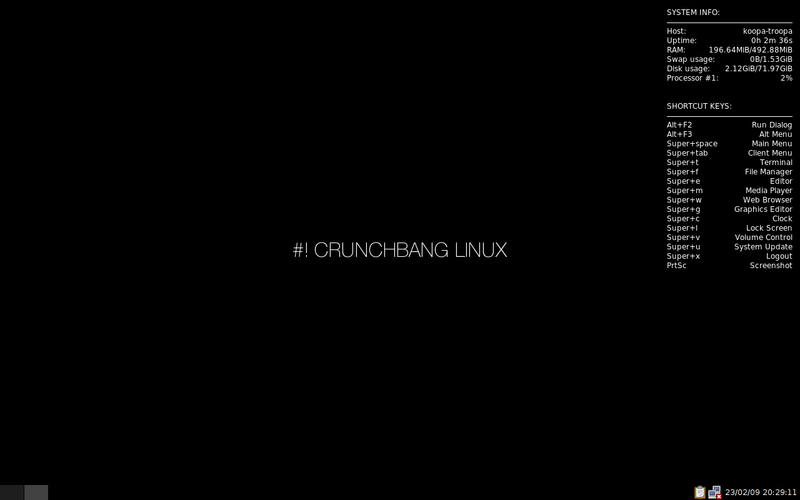 So what do I think of Crunch Bang Linux? A few days ago I said that there was no reason to install Ubuntu instead of Linux Mint. That still holds if you’re talking about an easy to use distro for a new user who needs all the multimedia codecs and a slick as heck looking distro. Well, now I feel the same way with Crunch Bang Linux, but for a different crowd. If you’ve been using Linux (or Unix) long enough that having a window manager like OpenBox doesn’t scare you and you like Ubuntu – why wouldn’t you use Crunch Bang Linux? Actually, that’s still a bit of a lie. Crunch Bang doesn’t include a lot of the “standard” programs such as Open Office.org. And if you’re going to start adding back in all of those programs – you might as well use Ubuntu. To revise, I’d say, if you are an intermediate to advanced Linux user who likes the “it just works” ethos of Ubuntu, but desire speed and efficiency – especially on a laptop then you should choose Crunch Bang Linux – there’s just no question about it. In a way, it’s funny that Ubuntu is becoming a Debian. After all, unless you need the absolute in stability, why not use Ubuntu? It’s essentially Debian Testing/Unstable. (Yeah, I know some Debian people would have some real beef with that statement – but in a lot of ways it’s true) So if you’re running a serious server – use Debian. But if you have a desktop and it doesn’t need to be rock-solid use Ubuntu. Except you shouldn’t – you should use Mint in that case. And if you need speed and efficiency for your laptop – use Crunch Bang. So where does Ubuntu fit? It seems to be getting crowded out by the success of it’s derivatives. Well, I’m going to leave Crunch Bang Linux on my laptop. My first real test will be when I travel in a few weeks – as that’s usually the time I use my laptop. I’ll probably be using it to watch videos or play games. At that time I’ll know if Crunch Bang can meet my needs or if I need to go back to Ubuntu. If I go back to Ubuntu I’ll be sure to blog about it. I intend to blog about my feelings of Crunch Bang, Conky, and Gwibber after an extended use, but I can’t guarantee I’ll get around to it – especially if there’s nothing extraordinary to report. In that sense – no news is good news. I had tried the 8.10.01 release on my EEE. Two major drawbacks for me. It didnt support XFS and JFS, and the whole system were designed to work only for en_GB. Poor internationalisation support. I dont know if they have solved either. For Crunchbang on EEE: I installed Cruncheee 8.10.01 on my EEE PC 901 three months ago. When installing, it grabs the needed internationalization-files from the servers. While the openbox-menu has to be configured manually (which is easy even for a linux – noob like me!) – the LXpanel-Menu is now perfectly german (that´s where i come from) . For me coming from and jobwise living in the windows-world (using Win2K), Crunchbang for me is the first Distro I really use regularly. Maybe it is just me, who are stupid, but what does the ‘Super’ in the shortcut keys list stand for? The Super key is the Linux term for the Windows key. If it is so, then it doesn’t work in my installation. If you do not have the “Super key ” there is plenty of easy and direct info in #! 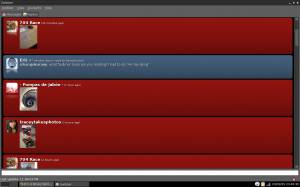 forums to easily customize your ‘keybindings’. I’m not certain, since it’s not a function i even use on my laptop, but I think you can, since it’s built from Ubuntu, and uses the Ubiquity installer. If it doesn’t, and you really depend on this, you can install Ubuntu CLI from the alternate install disc (with the encryption) and then wget a simple script to turn it into a full (or lite edition or cruncheee edition, depending on script) crunchbang install. I tried the live cd this morning, and was extremely impressed with the load time, the completeness yet lack of overkill of apps and features. Full media functionality, all codecs included, and video that never worked in ubuntu worked out the box in !#. Yes I agree somehow my wireless was faster in !# also. I just downloaded CrunchBang and I’m quite excited about it, I can’t wait to see it in person!